VIRAL VIDEO "FIRST KISS" FEATURES SOKO'S SINGLE "WE Might Be Dead by Tomorrow"
Soko performs at Make Music Pasadena 2012. Soko, (aka: Stephanie Sokoliski) who is currently in the studio recording her follow-up to her critically acclaimed 2012 debut album I Thought I Was An Alien, looks to continue her success with her second full-length album, My Dreams Dictate My Reality. Recently, her single "We Might Be Dead by Tomorrow," off her debut album, has found a resurgence after it was featured in the 3 minute viral video "First Kiss" which features twenty strangers kissing for the first time. The single has since debuted at No. 1 on Billboard's Streaming Songs chart and No. 9 on the Hot 100 last month. Check out the official video for "We Might Be Dead by Tomorrow" below along with the short video "First Kiss." First Kiss featuring the song "We Might Be Dead by Tomorrow" by Soko. Last year, as she was touring in support of her debut album, when we saw her at the Jubilee Music and Arts Festival we wrote "...She has that stabbed innocence feeling, tormented and twisted with misunderstood emotions. A wounded animal singing to survive as she watches people pass by without slowing their stride. Her frustration turning into darkness behind the twinkle in her eyes.... She has been hurt, and had enough of taking things kindly. Her retaliation is in her release as SoKo. Erratic anger turned into raging music of truth." 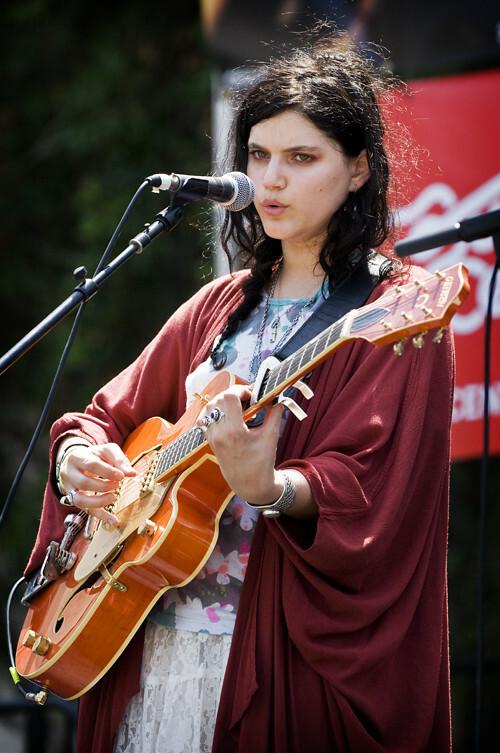 A self-taught talent, Soko began writing songs at age 20, teaching herself guitar after seeing a friend play music and realizing she wanted and could do that, too. After moving to Paris, radio stations in Denmark, Belgium and Australia started spinning her music, and soon she was playing gigs with Daniel Johnston, M.I.A., Babyshambles, and Azure Ray, among others. In addition to her songwriting and acting, she is also known for directing her own boldly spirited DIY music videos and creating her own artwork. "We Might Be Dead by Tomorrow" by Soko.